These are some designs and ideas for an indoor maze. The first design I came up with was a series of interlinked rooms. I had the idea that at the exit or entrance to each square (or room) in each doorway there would be a curtain that prevented you seeing what was beyond. So if you stood in each room all you would see in each one is the four curtains. I imagine the room to be plush red Victorian study type rooms all with exactly the same furniture, perhaps a round mahogany table in the centre, a dresser and a bookcase, all in exactly the same location with exactly the same stuff so whatever room you entered it had exactly the same layout. If you wanted to be really difficult you could give the room furniture a 2 or 4 fold symmetry. Of course if you wanted to be devilish you could change one item in each room, perhaps the book title of the third book on the third shelf would always be different, or there would be a silver spoon somewhere different in each room. Each room would not only be part of a larger maze but a sort of Sherlock Holmes esque spot the difference competition. After this initial design I thought there was still lots of white space and really it could be a lot more of a complex maze. Now this is much more of a maze. Still the same curtains in each room but now when you leave the bright room you enter not just a corridor between rooms but a dark maze of twist and turns lit in shadows as you find your way to the next room. This also has dead ends in the maze so you can get lost, although once you learn the symmetry of the maze it becomes a lot easier. To add to the darkness visitors to the maze would have torches as the dark areas are barely lit. There are lots of other variants to the maze, I can imagine actors roaming the maze telling stories to visitors, different lighting effects both in the dark areas and the room. Although I would probably want to stick to the rooms as places of quiet sanctuary and only the dark areas being the scary part. I imagine in the darkness you could have scary footsteps, howls and thunder and lightening, it would be a fantastical yet scary place. I have also had practical thoughts as well, the entrance would be in the bottom left and the exit in the top right, but an emergency escape route would be a corridor that runs all the way round the outside. I want to call this maze design crop circles and if it was ever made into a maze it would have to be made out of maize. There is no master plan with this maze, the idea is that the walls represent the overlapping rings of three rain drops on a still puddle. 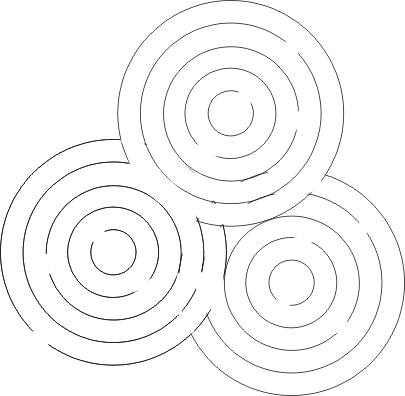 One challenge for the maze would be to find the centre of each circle and then find your way out again in the quickest possible time. There is only one entrance, you go round and round in circles and come out the same way. To solve it should be fairly simple, there are only 1 or 2 dead ends and they are fairly obvious especially if the aim is to head to the middle of each circle. Still an interesting little design, quite artistic if not exactly challenging. Well the original plan was to complete step 2 by the 09 September 2010. Unfortunately at this time step 2 is only partially complete. Mission pages updated, although would have liked to expand. Create a maze history maze – created definition and glossary but needs more work. In conclusion I am about 40% completed. More work to be done. The original deadline was the 09 September but in reality I probably need to extend this by at least a month to the 09 October 2010. The target was realistic but my time was diverted by pressures of work and other projects (more important in the short term). The decision not to work on the maze project was justified. In my last maze idea post I talked about a colour light maze laid out on the floor with red and green lights, well here is one that I quickly put together to demonstrate the idea. The design shows the maze with all the lights on to show the path. In reality you would not know whether you remained on the right path until you stepped onto the square. I don’t think this maze needs any dead ends as it will be hard enough anyway but as it is all computer controlled it would be very easy to put in a different harder design. 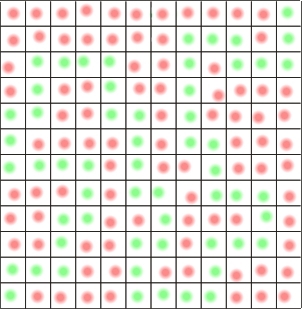 With a computer you could even generate completely random mazes. Clearly once you have your maze design of passageways and paths you need to decide what you are going to build the maze out of. There are many various standard ideas which we will look at in a subsection of maze designs but these posts will be about our ideas for concepts for laying out mazes in terms of materials and structure. They are more unique ideas which may or may not have been seen before. Some of them may eventually be built by us others may wait here hoping for a bit of attention. If you want to help develop these ideas in partnership then you should get in touch but don’t just steal them. This idea has been rattling around in my head for some years although initially it wasn’t a maze idea. Most people will have seen light trail photos which are long exposure photos so light sources such as brake lights leave trails across the photos. Well this idea is firstly about creating light trails. My original vision was to pave an entire high street with pressure sensitive tiles which lit up as people stepped on them. Then after they stepped off they waited for two seconds then faded over a another two seconds to give a light trail with a faded trail. In this idea there is no maze so each person walking across the floor would have there own light trail behind them. Ideally this would be turned on at night when there are less people around and the light trails are easier to see. Now the maze idea is still with the pressure sensitive floor is now with the lights laying out the maze so you start in one corner and move onto the next tile, if that is a path through the maze then the light goes green, if it is not it goes red. 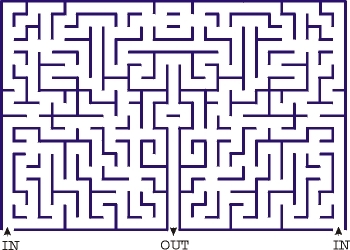 Then you progress like that except if there are dead ends in the maze and you get to one you wont know your route back so you will have to feel it out again. Remembering the green lights wont stay on but will slowly fade away. There are other flavours of this maze as well, it could be a sound maze as well giving you a “ding” when you step on the right tile or a “uh – uh” when you step on the wrong tile or it could squirt you with water if you step on the wrong tile, straight up between the legs. Plus of course you could wire it all up to a computer and have a different design ever hour of every day, so it would be ever changing. So as you can see this is an excellent maze concept and part of the challenge of the maze project is putting these ideas into reality. So I have the idea, I can even design the mazes now I need some help in moving this concept forward. If you think you can help with this concept do please get in touch. Really small maze designs although not a challenge to work out how to get from the start to the finish can be quite artistic. 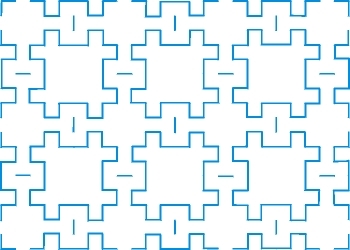 These mazes can also be used to illustrate some simple points. 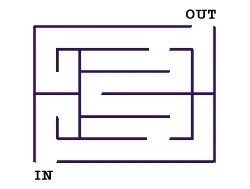 For instance this maze has 2 paths to the exit and 2 dead ends. Interestingly it is 14 squares on either route from the start to the finish. This maze is a symmetrical one route maze with 5 dead ends but several of them can be seen as a dead end from the junction before, one from the exit itself. As the main idea of a maze is to send you down paths without knowing if it is a dead end then this maze does not really fulfil that requirement but it does look quite artistic. Every story has a beginning and this is ours. The Maze Project – Plan B is about an idea, an idea to give up the day job, move to the country and build a maze. Stating our mission does not mean we get there any faster but we have to start somewhere and so we start with this blog. 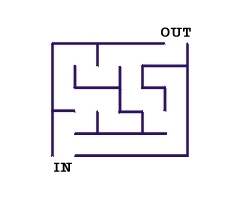 In the days, months and probably years, this website will build into a resource about mazes, including a brief history of mazes, UK maze information, photos, designs, maybe even merchandise. The blog will chart the rise of the website and the development of our own attempts at mazes. The story starts with this blog and will hopefully end with a review of our new maze attraction in the South West of England and a link to our new website. We have a dream and this blog is only the beginning.